It is many years now that the resistance of Iranian women against the theocracy in Iran has become a paradigm for many women, especially Muslim ones, worldwide. This resistance is not just against the religious dictatorship ruling Iran, but against the Islamic fundamentalist mindset that has brought suffering to many countries in the Middle East and beyond. Prior to focusing on the resistance of Iranian women, a look at the barbarity of this dictatorship against women is warranted. Oppression of this vulnerable half of the society aids and abets the regime to suppress the whole of the Iranian society. It is 40 years now that the Islamic fundamentalism ruling Iran has placed enmity towards Iranian women at the core of its atrocities. Oppression of this vulnerable half of the society aids and abets the regime to suppress the whole of the Iranian society. Regime’s misogyny feeds on a medieval mindset that regards a ‘woman’ as an incomplete creation to be subservient to ‘man’ and to serve him as a slave. How has the regime treated Iranian women and thus the entire society in these 40 wretched years? The crimes perpetrated against and the hardship imposed on the Iranian people is truly horrendous: From imprisonment, torture and execution of dissidents to pre-sale of newborns; from homelessness to selling of girls to neighboring countries or forced marriage of teenage girls. Many restrictions are imposed on women. They are not free to choose their clothing and favorite sports, and need consent from their guardian males to travel abroad. The available statistics and reports in the media paint a picture of this living catastrophe. According to the Women’s Committee of the National Council of Resistance of Iran, since Hassan Rouhani’s presidency in 2013, eighty-seven women have been executed in Iran. Forced veiling has been amongst the main tools in suppression of Iranian women since mullahs came to power in Iran with 26 government organs tasked to carry it out. Hassan Rouhani bragged that he was the first official to impose mandatory hijab in the public sector where he ordered any female employee not observing the dress code to be barred from entering the work place. Rouhani has also supported barring women from certain jobs. In August 2014, one year after Rouhani had come to power, a security forces official stated that women have been barred from working in coffee shops and restaurants along intercity roads. Out of 2653 positions to manage cities, towns, townships and provinces, only 13 is occupied by women. Job scarcity for college-educated women has continued into Rouhani’s government. While 60% of those taking admission tests to universities are women, a large percentage cannot find any job once they graduate. 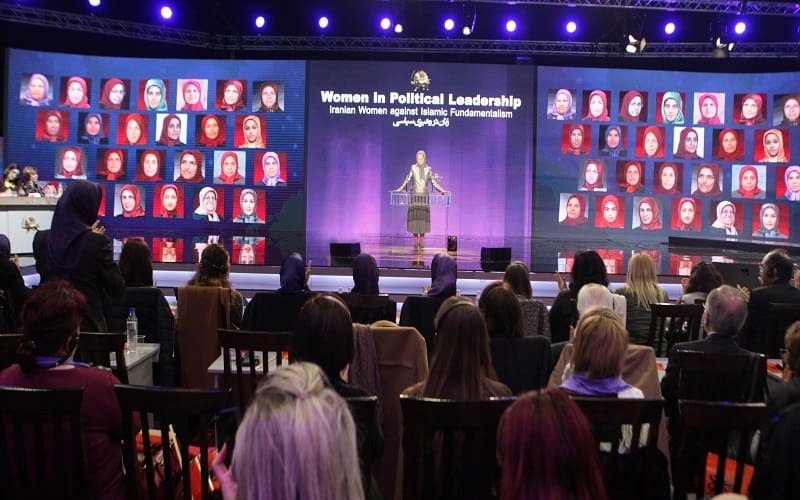 ISNA state news agency quoted Massoumeh Ebtekar, vice-president for Women and Family Affairs, on February 2019 that “our statistics say that unemployed educated women are 2-3 times the number of their male counterparts”. What has been the reaction of Iranian women to this pressure, oppression and discrimination? The courageous resistance of Iranian women against mullahs’ tyranny began with the assumption of power by Khomeini and his slogan “either wear a scarf or get beaten”. This resistance has manifested itself during all the years of dictatorial rule and we can see women at the forefront of protests in the past tumultuous year. Women partook in at least 850 protests in the past 9 months. Female students at universities were also actively involved in at least 300 student protests since last December where they voiced their ‘NO’ vote to the fundamentalist rule in their country. They have turned schools and universities, government buildings and streets to sites of protest and strike and have encouraged others to participate in anti-government protests. Their resistance to tyranny and refusal to succumb to coercion is to be praised. And thus they are a beacon of hope and resistance for women against religious fundamentalism such as advocated by ISIS and other terrorist groups.